The young Anastasios set off then for the seaport where he would board a boat to Contsantinouple. He was faced with a problem, however. Anastasios did not have the money to pay the required fare for the boat. Nevertheless, as the boat for Constantinople was ready to sail Anastasios bravely walked up to the captain and asked to take him along. The captain, however, seeing him so young, said to him jokingly, "Take a walk, my little one, and when you come back I will take you." The boy understood what the captain was actually telling him, and began to walk away sadly. The captain turned on the engines in order to sail. The engines were propelling, but the boat would not move. He increased the power to the engines, but to no avail. Even at full throttle, the ship still would not move. In his helplessness the captain glanced up, and his eyes met the gaze of the boy who was standing on the shore in sorrow. Against his will he was moved and, relenting, he told the boy to get on the boat. Anastasios jumped into the boat, and the captain again became engrossed in how to make the ship move. But he did not have a chance to worry long, for it began to move immediately, since it had received its "special passenger." The ship rushed along now in open sea on route to Constantinouple and the crew conducted a ticket inspection. The young boy became terrified since he did not have a ticket nor any money to purchase one. He looked about for the captain who knew his secret but he had stepped away. “I will tell the truth”, he thought to himself. When asked for his ticket he said, "I am poor. I have no money. I have left my poor parents to seek work, so that I can help them." His cheeks glowed red for Anastasios was very embarrased. But, as our Lord does not abandon those who believe in Him, the sailors felt sorry for young Anastasios and let him go. Other passengers heard his story and went to his aid. They listened to his story, his problems. One man in particular, a cousin of a very rich man, John Horemis was particularly impressed by the young boy’s courage and dedication. He sealed the letter with confidence and wrote on the envelope: "To the Lord Jesus Christ in Heaven." He took his letter and went to mail it right away. On the way, by divine economy, he met the owner of a merchant shop that was opposite where he worked. This man knew him well and, knowing very well of the boy's innocence and diligence, had come to feel great compassion for him. He also was going to the post office. "Anastasios, where are you going?”, he said to the boy. Anastasios became troubled and whispered something, holding the letter in his hands. "Give it to me so I can mail it, and you won't have to go all the way." Frightened and unthinking, the little Anastasios gave him the letter. The merchant took the letter with much love, patted him on the head and told him not to worry while he put the letter in his pocket with his own other letters. He told Anastasios to go back and that he would take care to mail the letter safely. Anastasios cheerfully returned to his work, and the merchant continued on his way full of happiness over that good and exceptional boy. As he was about to mail the letter the merchant noticed the address noted on Anastasios’s letter. Thunderstruck, he stopped and, conquered by the temptation of curiosity, opened and read it. He was overwhelmed with emotion as the man began to cry. He put an amount of money into an envelope and sent it, anonymously, to the boy along with fatherly advice on how the money could be spent wisely. Anastasios was filled with joy when he received it, and gave many thanks to God. The next day Anastasios set out to purchase new clothes. Upon his return, his employer noticed him and thought that the boy had stolen the money from him. Therefore, he was going to beat him and fire him. But Anastasios cried: "I have never stolen anything in my life! Don't hit me! My little Christ sent them to me!" The merchant across the street overheard the commotion and took Anastasios' employer to the side in order to explain the matter to him. Therefore, as a shop assistant of a tobacco merchant Anastasios spent long and hard hours. He started early and finished late but somehow made the time to continue his studies late at night. He read as much as he could the Holy Scriptures and Writings of the Holy Fathers, and made a collection of wise sayings, which he used to write on the paper used to wrap his customers' goods since he did not have the money to buy paper. Later he worked as a teacher of the lower grades in the orphanage of the All-Holy Sepulchre. When he was twenty, Anastasios, now a handsome young man, went to the Island of Chios where he was appointed teacher at a village named Lithi. He was always present at church services and was never far from those in need. All who knew him spoke with the highest regards for Anastasios as he had earned much respect for his wisdom and example as he tirelessly served his church and community and instilled in his students the Word of God. Seven years later, at the age of 30, he entered the great and renowned monastery of Nea Moni for Anastasios had long yearned for the monastic life for it would allow him to study the Holy Scriptures ever-harder and fullfill his dream of the priesthood. After completing three years as a novice under the care of the venerable Elder Pachomios, on November 7, 1875, he became a monk and received the name of Lazarus in his tonsure. Even harder now he studied, prayed and fasted day and night. Many nights he would pray till sunrise without sleep and then continue praying for the rest of the day. Two years later he was ordained deacon by Metropolitan Gregory of Chios, due to his great virtues and his piety. It was at his ordination as deacon that he was given the name Nectarios. Truly it was a prophetic name, a name that would give one an intimation of the divine nectar that the Holy Father was to become, through his holy sermons, and especially through his holy way of life, to the pious Christian people. 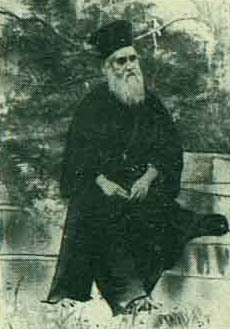 Nectarios Kephalas had only completed elementary school, therefore, Elder Pachomios convinced him to complete his high school studies in Athens. This was made possible through the financial support of a wealthy local benefactor, Mr John Horemis. John Horemis was the uncle of that unknown man who was on the boat when the young Nectarios was travelling to Constantinople, those many years ago. Horemis had heard of Nectarios and wished to meet him. With the help of God it was not long before a meeting was arranged. Horemis' first impressions were excellent. He wanted to find someone to sponsor, to educate, with the aim of leading Greece's uneducated masses. He saw in Nectarios not only the man for the job but a man who he could totally trust. Eventually Horemis told Nectarios of his plans. Nectarios gratefully accepted. So Nectarios Kephalas went to Athens to begin his studies and upon finishing went to Alexandria in Egypt, near the Patriarch Sophronios, carrying with him the excellent reference of his sponsor John Horemis. The Patriarch was deeply impressed with the humility and the holiness of Nectarios. The Patriarch asked him if he wanted to continue his studies at the Theological school in Athens, so that he could then return and take better care of the needs of the Orthodox Christians of Alexandria. Nectarios accepted and duly enrolled at the school. Day and night Nectarios thanked God for everything. He prayed for Sophronios and all who had helped him. It was at this time that Nectarios Kephalas lost his close friend and benefactor-John Horemis. But thanks to the generosity of this pious islander and to the protection of Patriarch Sophronius of Alexandria, Nectarios Kephalas was able to complete his studies in Athens and to obtain the diploma of the Faculty of Theology. 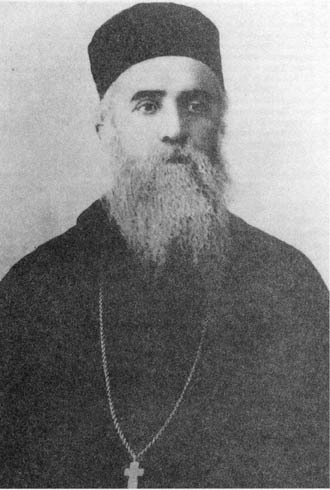 In 1885, he arrived in Alexandria where he was soon ordained priest, then consecrated Metropolitan of Pentapolis (an ancient diocese in Cyrenaica, in what is now Libya). He was appointed preacher and secretary to the Patriarch, whose representative he became in Cairo, where he had charge of the Church of Saint Nicholas. Our venerable Saint Nectarios lost nothing of his humility through these honors, and was able to inspire his flock with zeal for the evangelic virtues. But the love and admiration of the people for him turned to his disadvantage. Because of his holy virtues, because of the spotless life that he led, because of his holy sermons, and because of all those things which made him stand out, immediately malice arose among his colleagues who were also Metropolitans of the See of Alexandria, and amongst the bishops and higher clergy. They did not like St. Nectarios because he was different from them. For this reason they slandered him to the Patriarch, Sophronios, saying that the holy Father had his eye upon the Patriarchal Throne, because he had this "false show of piety," as they called it. They did not want to recognize his true virtue and unmatched spiritual beauty. Instead they said that all his virtue was only a show so that he would be considered holy by the people. He was accused of using his popularity with the people to dethrone the Patriarch. Since our Holy Father was truly so popular with the people, the Patriarch was easily convinced that he was in danger. For if the people rose up, truly Nectarios would have much power. Little did they know the true worth of the man. Little did they understand that he was not a proud man, and not ambitious, as they were, for positions and for power and for glory. The Saint made no attempt to justify himself but placed all his hope in the promise of Christ who has said: Blessed are you when men revile you and persecute you and utter all kinds of evil against you falsely on my account (Matt. 5:11). In this way, and for such reasons, they suspended the Holy Father as Metropolitan of the throne of Pentapolis. 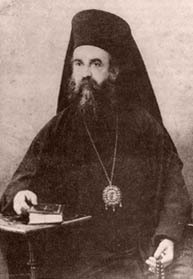 The Patriarch himself, who was a very great "friend" of the Father, wrote that ambiguous letter of suspension, which later became the cause of much scandal, saying that for "reasons known to the Patriarchate" he was suspended from the Metropolis of Pentapolis, but that he was allowed to remain at the Patriarchate and to eat at the common table. This way he could become wearied of St. Nectarios and mistreat him. St. Nectarios was essentially deprived of all means of lodge and shelter. If St. Nectarios was called by individuals to bless marriages or baptisms, he could officiate only if canonical permission was granted by the bishops in those places, or by the Patriarchate. Thus, he was not defrocked per say, nor was he suspended from ecclesiastical functions, but he was taken away from his throne to be without position. The holy Father very humbly endured these slanders and the suspension from his throne but because he was popular with the people, there were grumblings and intrigues that arose from the people to demand what was the cause for the holy Father's suspension. But so ever venerable was our holy Father, that he secretly left for Greece, so that his popularity would not be a disturbance in the Church of Alexandria. He was given a letter of dismissal that only complicated matters since those againsts him knew that they would be embarrassed if the truth were known about the true matter of his dismissal. Therefore, they sent letters, both anonymous and signed, to influential people in Greece, slandering the Father as being unethical and immoral, that he was not an upright person, and that for these reasons he was suspended from his position. Alone, ignored and dispised, our Holy Father embarked for Athens. Many days he would lack even his daily bread, as he kept nothing for himself and gave all the little that he had to the poor. When the Saint appeared in Athens with this paper of suspension and with the negative rumors already broadcasted before he even arrived, there was truly cause for most people to believe that there must have been good reason for his suspension. For behold, they saw a paper which said that he was suspended "for reasons known to the Patriarchate," Hence, when bad rumors go around about someone, outsiders to the situation usually fall victims of beleiving them. Such was the case with our Saint as both the state and the Church authorities refused to give him a position in the Church of Greece. St. Nectarios was left without means of support, a stranger amongst his own, without lodging, without food, without even the most simple means of subsistence. Every day he would go to the office of the Minister of Religion so that something might be done for him and every day he was turned away. He thought about going to Mount Athos for monastic retreat but gave up the idea as he wanted to help others more than he wanted to help himself. The Lord does not abandon those who trust in Him, and one day as our holy Father was sadly going down the stairs of the office of the Minister, having been told once more that his case was being looked into, and that they would let him know when something came up. He was met by a friend who had known him in Egypt, and knew his former glory and virtue. He was surprised to see him in such a state, and very sadened. When he learned the cause of his sadness, he could scarcely believe it. He went and interceded with the Minister of Religion and Education, and they appointed the Saint to be preacher of the diocese of Vitineia and Euboiea. Can one imagine? The former Metropolitan of Pentapolis now a mere preacher! Something which a simple monk can do. Something which even a layman that has a gift can be given permission by the Synod to do. Yet he did not at all think that this was humiliating for him, or that it was a small thing. His yearning and desire to help others made him consider this opportunity as one of the greatest things…to be able to preach the Word of God to the people. He did not consider that he was merely given a crumb from the table that was being thrown down to him as if he were a dog, but he immediately took it up and, putting his heart into it, became earnest in his work of preaching to the people. Thus he arrived on the Island of Euboiea, and there he began to preach from one church to the other. But rumors of our Father’s slanders had reached Euboiea too about this just and blameless Saint who asked nothing for himself and everything for others. Many times when he was preaching, people would begin to smirk and laugh and whisper to the degree of causing commotion. At the beginning the Saint did not understand, for he was truly a humble and simple man. Later he understood that they were talking about him, and that they were laughing about him because of the slanders of being immoral and unethical. Thus he saw that, instead of fortifying souls, instead of edifying souls, instead of being able to really teach the Word of God, he was doing harm. The people believed the rumors, and when they heard him preach good things, they were more scandalized than if he did not preach at all. Therefore, even though he had no other means of support except this position which had been given to him, he resigned from his own will in order to not further scandalize the people, and returned to Athens. By that time there were a few people who had come to know Him and to understand that he was truly a good man that had been slandered. They had come to love Him because they did not see in His way of life or in His conversation anything that would evidence the things that were slandered about in Egypt. These people were influential in having Him appointed dean of the Rizarios Seminary in Athens. He would liturgize in the seminary church of St. George, the Great Martyr and Trophy-Bearer, as a bishop-priest. The clergy and students at Rizarios were well aware of the rumors surrounding our holy Father but how ever able was He to gain the love and respect of those around Him. He would teach the students, for he was truly a wise man and very learned, as is shown by the many works which he has left us on the state of the souls and the resurrection of bodies. About why we have the memorial services, and many other subjects. The School’s spiritual and intellectual standing rose rapidly under his direction. The students found in him a teacher with a deep knowledge of Scripture, of the holy Fathers, and even of secular learning, and a director who exercised his authority with great kindness and consideration. His administrative and teaching responsibilities – he taught pastoral theology – did not prevent him as a monk from living a life of ascesis, meditation and prayer, nor from fulfilling the high calling of preaching and serving regularly the holy Mysteries, at the School as well as in the greater Athens region. However, there glowed in the depths of his heart a burning love for the peace and quiet of life in the monasteries. Seeing that there was much ado in the capital, many intrigues, many words, much noise spiritually and physically, he, being a quiet person, wished to retire from all this and go to a place where he could be with God and pray according to his heart. Thus he began to look around outside Athens to find a suitable place. He went to the island of Aegina where he heard that there were many small monasteries and churches that were in disuse. This led him to respond warmly to the desire expressed by some of his spiritual daughters that he should found a women’s monastery on this island. This he did between 1904 and 1907 and he retired there in 1908, on his resignation as director of the Rizarios School. In Aegina, about two hours by foot from the main city down by the sea, He founded a little church which was once a small monastery dedicated in honor of the Most Holy Trinity. With his own hands the Father began to rebuild a few of the cells that were around the little church. A blind nun, Xenia, at that time came to know the Father, and he respected her very much. He made her mother superior of the first little community. A few other souls came, and thus the holy Father Nectarios with the blind mother and these few souls began their little convent. Despite countless cares and difficulties, Saint Nectarios saw to the restoration of a type of life that was wholly in the spirit of the ancient Fathers. He gave his utmost bodily and spiritual strength to the construction of the buildings, to divine service and to the spiritual direction of each one of his disciples. Because the Father was truly a gifted man, especially in the matter of confession, many would flock to him even from the capital. Thus he truly became a light on the island of Aegina and the foremost confessor and spiritual father of the country of Greece at His time. Through the help of his spiritual children and donations of the other people who came to understand their godly way of life, they were able to expand their little convent so that little by little a community of thirty nuns was gathered. The Saint would say: "I am building a lighthouse for you, and God will put a light in it that shall shine unto the breadth and length of the whole world. Many shall see the light and come here to Aegina." But the nuns could not understand what he was trying to tell them. It was only after the recovery of his holy relics and miracles that he began working in such abundance that they understood. He meant that his way of life, his very holy body, were the lighthouse, and if God pleased He would send his light, and it would shine throughout. Thus the words which the Saint used to say to them have been fulfilled. They would often see him in his worn-out cassock working in the garden or, when he disappeared for many hours, they would guess he had shut himself in his cell to raise his intellect to God by bringing it down into his heart, to taste there the sweetness of the holy Name of Jesus. Although he desired to flee all contact with the world and strictly limited visits to the Monastery, the fame of his virtues and of his God-given graces spread in the region, and the faithful were drawn to him like iron to a magnet. He healed many from their sicknesses, and brought rain to the island in a time of draught. He comforted, consoled and encouraged. He became a true miracle worker through Christ who dwelt in him by the Grace of the Holy Spirit. He kept company with the Saints and with the Mother of God, and they often appeared to him during the holy Liturgy or in his cell. During the difficult years that followed the First World War, he taught his nuns to rely from day to day on the mercy of God. He utterly forbade them to keep any food in reserve for their use, instructing them to give away to the poor everything that remained over. Saint Nectarios also found time to write a large number of works on theology, ethics and Church history, in order to strengthen the Church of Greece in the holy tradition of the Fathers, which was often unknown in those days because of Western influences. Saint Nectarios lived like an angel in the flesh with the rays of the uncreated light shining around him, yet once again he was calumniated by certain members of the hierarchy who made malicious accusations about his monastery. He bore these latter trials with the patience of Christ, meekly and without complaint as he did the painful illness which afflicted him for more that eighteen months before he spoke of it. He thanked God for putting him to the test in this way, and did his best to keep the pain he suffered secret until the last days of his life. After a final pilgrimage to an icon of the Mother of God venerated not far from the monastery, he told his disciples of his coming departure for Heaven. Therefore, on the afternoon of September 20, 1920, a nun by the name of Euphemia brought a little rassa-clad old man, who was convulsed with pain, to the Aretaieion Hospital of Athens, a state hospital for the poor. The intern of the hospital asked the nun for information about the little old man so that he may register and enter into the hospital register. "He is a monk?" The intern laughed sarcastically. "Leave off the joking, Mother. Tell me his name so I can put it in the register." "He is a bishop, my child. He is the Most Reverend Metropolitan of Pentapolis." "For the first time in my life I see a bishop," muttered the intern to himself, "without Panagia, gold cross, and -- most significant of all -- without money!" "Indeed he is a bishop," repeated the nun. "The Metropolitan of Pentapolis. This metropolis belongs to the Patriarchate of Alexandria. He is the Most Reverend Nectarios Kephalas. Some time ago he left Egypt and came here, close to you, as a matter of fact, because he directed Rizarios School. For some years now, however, he has lived as a monk in the convent of the Holy Trinity on Aegina. There he became gravely ill and in spite of his protests, we brought him here." She then showed the intern his credentials which proved him to be the Metropolitan. The intern of the hospital, amazed by everything he had heard and seen, shrugged his shoulders and told the nurses to place the sick man in a third-class room where there were several beds for the destitute. The doctors diagnosed that the sick little old man was suffering from severe systitis, a disease of the bladder. For two months the Hierarch Nectarios Kephalas lived in the midst of terrible pains, and at ten thirty in the evening of the eighth of November, 1920, in peace and at prayer he gave up his spirit unto God at the age of seventy-four. In the final days of his life, the Saint was kept in the ward of the incurable in the midst of many poor, sick people who were about to die. Next to his bed there was a man who had been paralyzed for many years. As soon as the Saint gave up his spirit, a nurse of the hospital and the nun who had accompanied him prepared his sacred tabernacle for the transfer to Aegina for burial. For this purpose they dressed the Saint in clean clothing. When they took off the Saint's sweater, they placed it on the bed of the paralytic to get it out of their way and continued preparing the Saint's body. And O, strange wonder!, the paralytic immediately began to gain strength and arose from his bed healthy, glorifying God. The day he reposed, the whole hospital was filled with such a fragrance that all the patients, nurses, and doctors would come out in the halls to ask where such a fragrance was coming from. For some days after, they could not use the room where they placed his relics because of the fragrance, even though they kept the windows opened, so strong was the fragrance. This room is now a chapel dedicated to the Saint. They took his relics to Piraeus and put them in the Church of the Holy Trinity while they prepared a small, wooden coffin. From there they took him to Aegina where they gave him a simple burial at the Convent of the Holy Trinity. Some years later, as is the custom in Greece, his grave was opened to take the relics out. When they opened the grave, what should they see but that the Saint was whole and fragrant. Not even his vestments had changed in any way. It was just as if he had fallen asleep and been buried that very day. They had not told the people of Aegina, because he had already worked many miracles and become very beloved, and a very large crowd would have gathered -- even from Athens and other places where he was known -- for the opening of his grave. So, early in the morning, as soon as they were finished with the Divine Liturgy, as it was dawning they went and began to open the grave. At the same time there was a taxi coming by on the road below the convent. Inside was a woman who had been to some resort place. She was not a woman of good repute, but of ill repute and many sins. As soon as they approached the Holy Trinity Convent, there was such a fragrance in the air that she told the driver, "Stop. What is that fragrance?" So he stopped and looked around. "Oh," he replied, "here is the convent of the Holy Nectarios. What else could such a fragrance be but that they are opening his grave today, and the fragrance is coming from the grave. For many times a fragrance came from his body before they buried him. And even from the grave it comes sometimes." Immediately she opened the door of the taxi and ran to go and see. She went up to the convent at the moment that they had opened the coffin and found the relics whole. She was very moved by this and by the fragrance, especially. She began to weep and publicly confess her sins. Thus she was corrected and became a prudent and Christian woman in her way of life. At that time they telegraphed to Athens to the Archbishop Chrysostom Papadopoulos, and he went to the island to see the relics for himself. After examining the relics, he irreverently counseled the nuns to leave the relics out in the sun and air for two or three days and then rebury him so that he would dissolve. Thus it is with those who pretend to be pious, and yet in their hearts have but the smell of corruption, the stench of death. They cannot understand the things of God, but blaspheme against the very Holy Spirit by such words and actions. The nuns, fearing the censure of the archbishop and also being simple, did as they were told. For two days they put him outside in the sun and air and then reburied him. But within a month or two they opened the grave a second time and took out the relics which were still whole and put them in a marble sarcophagus. In 1934, fourteen years after the repose of the Saint, a doctor was coming from one of the villages on horseback and was caught in a very heavy rain in the area of the convent. He got down from his horse and went and stood under a tree. It was raining so hard that he saw it would not let up for a long time. Therefore, he decided that as there was nowhere else nearby, he might as well go to the convent. He had known holy Father Nectarios while he was living, but being a man who did not believe much in such things, he did not reverence the Father much. So he went and knocked at the convent and the nuns opened and put him up for the night. It was evening, and they would not keep any man inside the convent, even the priest of the convent, as it is forbidden by the canons, but they had a little place outside for guests. But as the gates of the convent had not yet closed, he wanted to investigate what he had heard about miracles and incorrupt relics now that he had come to the convent. So he went while it was still light to where the sarcophagus was outside of the church. He began to pull off the heavy marble slab which was on top, as it was not fastened in any manner. He pulled it down to the waist of the Saint. At that very moment a nun happened to come by, and she began to cry out, "What are you doing there? What are you doing, opening our Elder's grave?" And he replied, "I just wanted to take a look." "But you did not have permission," she insisted and began making a commotion. But in the meantime anyway, he investigated the relics. [Later he said, "I was very amazed to see that it was the Father Nectarios that we all knew. And that he could still be recognized from his face and expression. Even his beard was intact; I pulled at some of his beard, but it would not come out. I touched his hand and saw that it was skin. It had remained so well on the bones (there was not much flesh) and had not shriveled up. He could be recognized by anyone who had known him when he was alive."] Then they closed the marble sarcophagus right away. 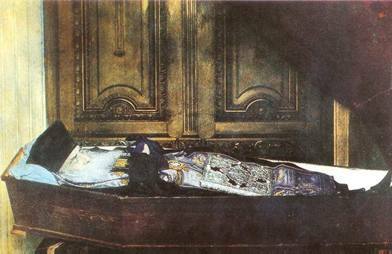 By the will of God, years later the relics of the Saint dissolved, and what we have now are his Holy bones. They have since been encased in the our Saint’s mitre in Aegina. The top opened so one can kiss the crown of his head. The other parts of his relics, which have much fragrance, are located in a silver box. He endured a life of calumnies, persecutions and false accusations. But God has glorified him, and miracles have abounded since his departure for those who approach his relics with faith or who rely on his powerful intercession. His body remained incorrupt for more that twenty years, distilling a delicate, heavenly scent, and then returned to the earth in the usual way. His relics were strongly redolent with the same perfume at the time of their translation in June 1953. This perfume has continued ever since to rejoice the faithful who come to venerate his precious relics with the assurance that Saint Nectarios has been received by God into the abode of the righteous. His veneration was formally recognized in 1961. The list of his miracles grows longer every day, and his shrine at Aegina has become a most popular place of pilgrimage in Greece.